A decorative map prepared by Prof. Johann Matthias Haas (1684-1742), who produced a number of continental and regional maps for the atlases issued by the firm of Homann Heirs in 1744. Kamchatka has been reduced to its proper size vis Ã vis Johann Christoph’s version, while Siberia is drawn with an outline familiar to us today. The coastal waters of Japan remain a little haphazard with Hokkaido -Terra Efo, Yedso ou Yesfo- still attached to the mainland, but Sakhalin Island (Sagalien) is clearly marked. 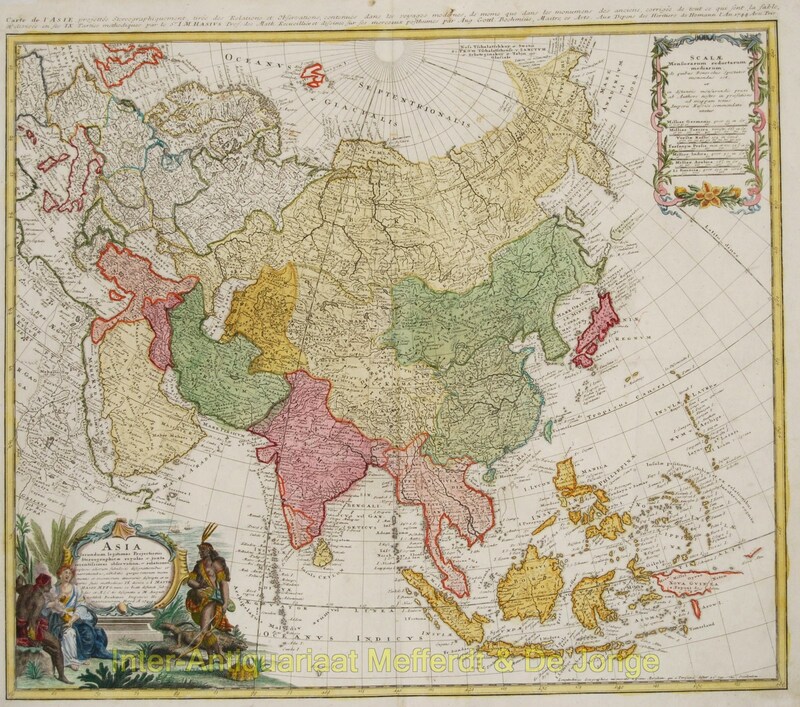 The Malay Peninsula has a very poor outline compared to earlier maps by Homann. Johor (Iohor) is located on the north-east coastline (somewhere in the vicinity of present day Kota Bahru). Tibet, which is named, bears the alternative title of “Dalai Lammae”. Original handcolouring. Size: 47,6 x 55,3 cm.